I have a DIV in my HTML page. I am showing this DIV based on some condition. But DIV is displaying behind any HTML element where I pointed the mouse cursor. I have tried all value for Z-INDEX property from 0 - 999999. Is there any minimum or maximum value of Z-INDEX property of CSS? And I am showing and hiding specific DIV for Hyperlink using +Jquery which is on main page. Some value types may have integer values (denoted by <integer>) or real number values (denoted by <number>). Real numbers and integers are specified in decimal notation only. An <integer> consists of one or more digits "0" to "9". A <number> can either be an <integer>, or it can be zero or more digits followed by a dot (.) followed by one or more digits. Both integers and real numbers may be preceded by a "-" or "+" to indicate the sign. -0 is equivalent to 0 and is not a negative number. Note that many properties that allow an integer or real number as a value actually restrict the value to some range, often to a non-negative value. My tests show that z-index: 2147483647 is the maximum value, tested on FF 3.0.1 for OS X. I discovered a integer overflow bug: if you type z-index: 2147483648 (which is 2147483647 + 1) the element just goes behind all other elements. At least the browser doesn't crash. And the lesson to learn is that you should beware of entering too large values for the z-index property because they wrap around. It depends on the browser (although the latest version of all browsers should max out at 2147483638), as does the browser's reaction when the maximum is exceeded. The minimum value of Z-index is 0; the maximum value depends on browser type. 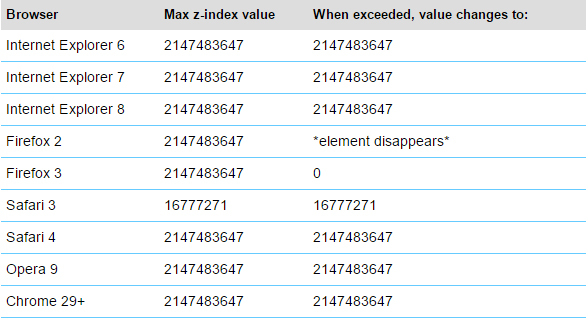 Out of experience, I think the correct maximum z-index is 2147483638. Z-Index only works for elements that have position: relative; or position: absolute; applied to them. If that's not the problem we'll need to see an example page to be more helpful. EDIT: The good doctor has already put the fullest explanation but the quick version is that the minimum is 0 because it can't be a negative number and the maximum - well, you'll never really need to go above 10 for most designs. I have found that often if z-index isn't working its because its parent/siblings don't have a specified z-index. item #3, or even #4, may be contesting #2 for the click/hover space, though if you set #1 to z-index 0, the siblings who's z-index put them in independant stacks now are in the same stack and will z-index properly. A user above says "well, you'll never really need to go above 10 for most designs." While INT_MAX is probably the safest bet, WebKit apparently uses doubles internally and thus allows very large numbers (to a certain precision). LLONG_MAX e.g. works fine (at least in 64-Bit Chromium and WebkitGTK), but will be rounded to 9223372036854776000. (Although you should consider carefully whether you really, really need this many z indices…). Not the answer you're looking for? Browse other questions tagged html css max z-index minimum or ask your own question. What is the highest possible z-index? Fancybox in mobile device is not working well ,fancybox overlay hide the fancybox wrap.